Anthropomorphism and The Absurd; so much to learn from William Kentridge. Things linger with me and if I am ever in doubt about what is important to me I just ask myself what has been hanging about in my subconscious for a few weeks or months. Important things stand the test of time. Back in January last year I visited The Tanks at Tate Modern. 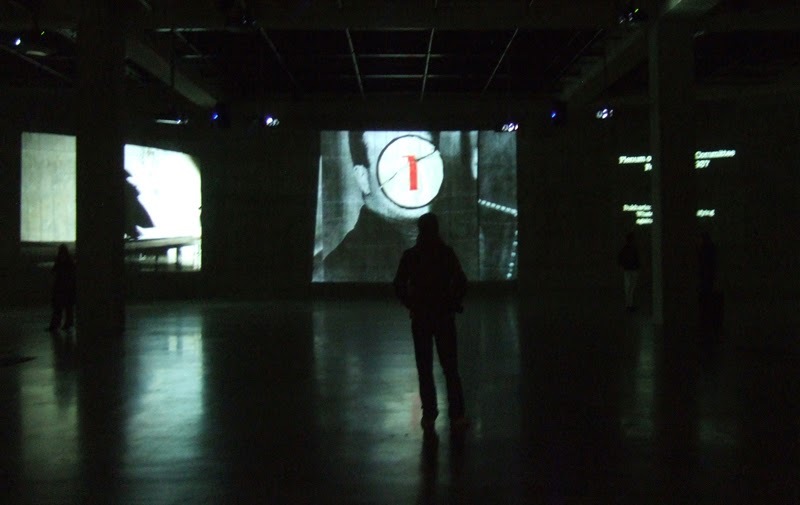 William Kentridge’s 8 channel video, 'I am not me, the horse is not mine', was the inaugural show at The Tanks and it made quite an impression on me. Surrounded by 8 huge screens in The Tanks at Tate Modern. I was most likely drawn at first to his appreciation of the absurd; something which has always interested me. The idea of a man’s nose taking on a life of its own and then the nose's life becoming more important than the man’s is definitely absurd and strange and interesting too. (This storyline makes up much of, 'I am not the horse, the horse is not mine'). I did make a short video of it however this one by erased culture is a better snapshot than mine. 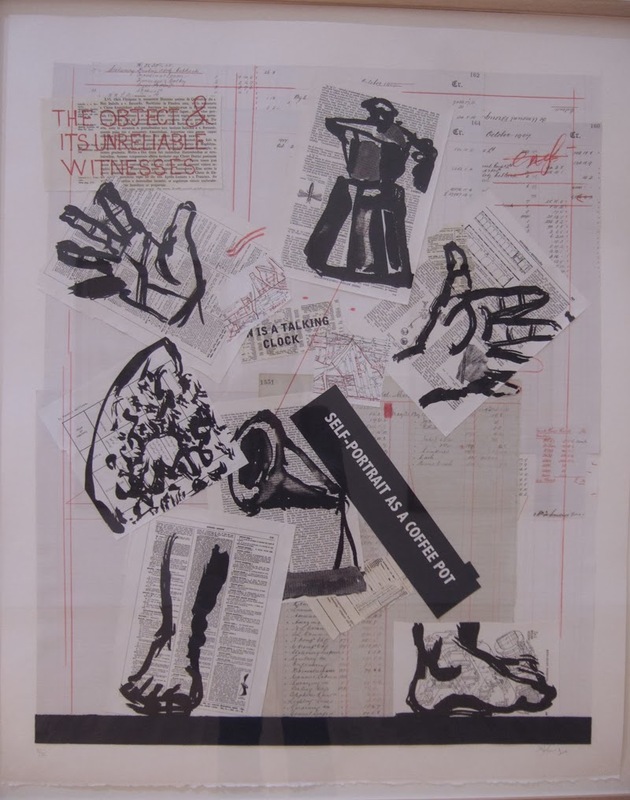 Later in March 2013 I went to see 'A Universal Archive: William Kentridge as Printmaker' at The Midlands Arts Centre in Birmingham. The show is a Hayward Touring show (Southbank Centre London) and it’s next venue is Aberystwyth Arts Centre 8th March- 16th May 2014. The show is a fantastic overview of William Kentridge’s (printmaking) career and includes over 100 prints from 1988 to the present. However his work is almost completely monotone and I personally need colour in my own work so I was still a bit puzzled as to what it was exactly that was drawing me to this artist’s work. Throughout the prints, drawings and etchings in the show there were some recurring visual motifs including: typewriters, telephones and the very classic Bialetti facetted metal coffee percolator. 'Self-Portrait as Coffee Pot' 2012 says it all. For me it is a perfect combination of the concept of the anthropomorphic and also a wonderful enjoyment of the the absurd. 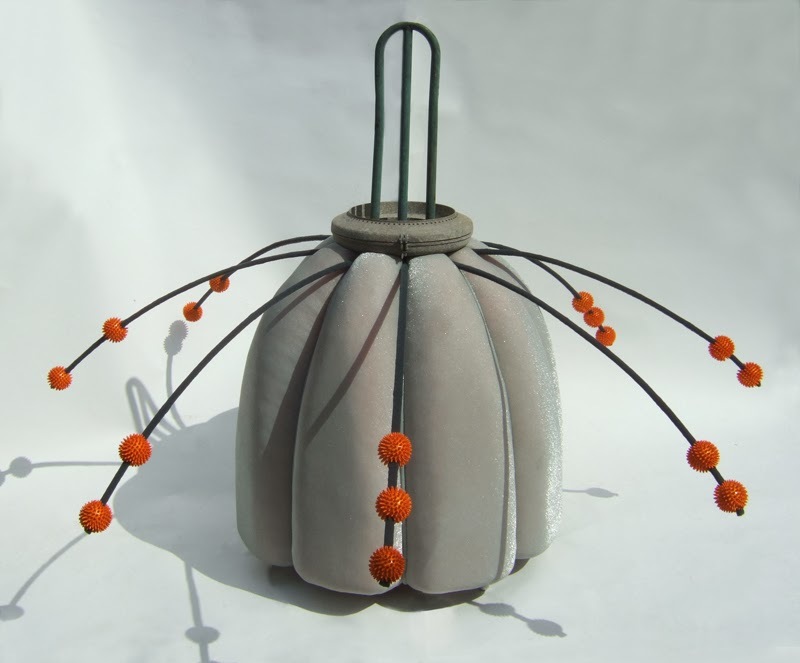 It has been said that my own sculptures (Frillip Moolog beings) have strong anthropomorphical qualities and I also have to admit to really liking the faceting on this style of coffee pot. Maybe I also enjoy seeing a solid shape sectioned into similarly shaped components? While walking round the show at MAC (Midlands Arts Centre) I got a strong sense of the absurd. And this is something that is given special mention in the excellent learning resource which accompanies the show. 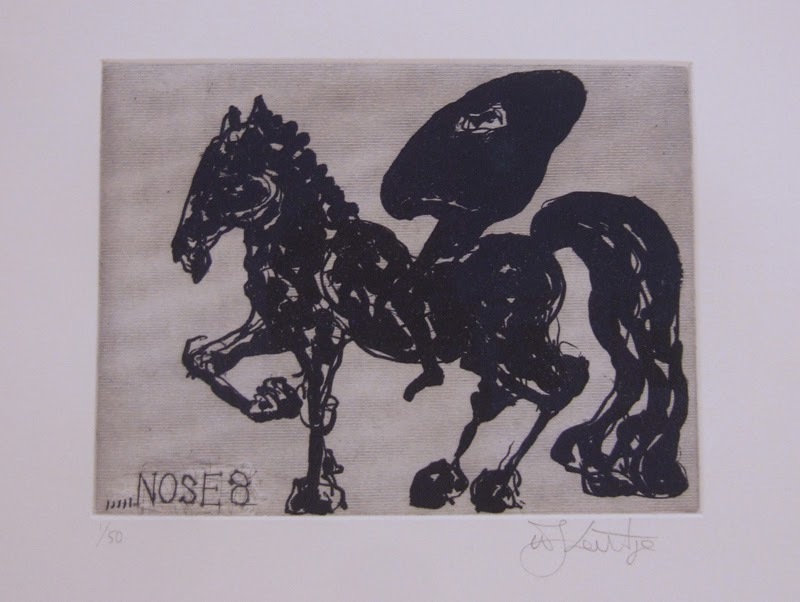 The Nose gets ideas of grandeur; here it is on the horse. 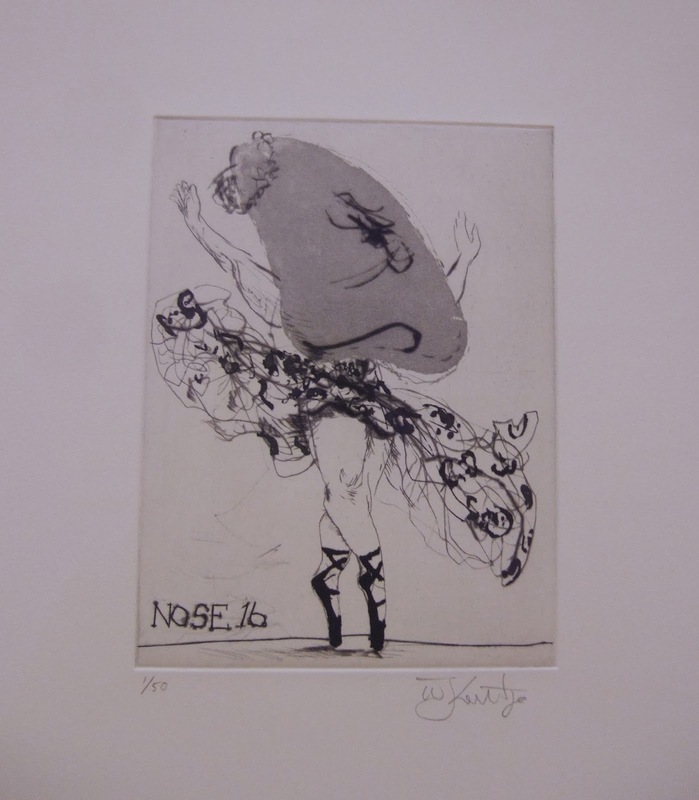 “Many of Kentridge’s works make reference to the idea of ‘the absurd’. Explored through literature, theatre, and art, absurdism was a philosophical movement linked to surrealism and existentialism, based on the idea that beneath the logic and structure by which we attempt to live or lives, there is meaningless to human existence. As well as exploring the idea that tragedy and disaster can befall us all, absurdism also makes evident the ridiculousness of the habits and structures by which we exist. Kentridge’s explorations also extent to the absurdity of apartheid; a system that had become brutally lost in its own ridiculous logic." Kentridge says that objects have suggested themselves to him (there is no political intent) and he and the audience project their own meanings onto these objects. Putting my own work in situations which might be interpreted as absurd is also of interest to me. 'Mi Wawa with Cows' and 'Hurgle Lenz: donkeydays'; do these photographs have absurd qualities? In the show there is a huge print of a woman with telephone in place of her head. 'Telephone Lady' (2000) At the time I didn’t realise that it was in fact a lino cut print; one on a very large scale 216cmx 120cm. Anyone who portrays a woman with a telephone as her head is definitely very interesting to me! As I walked through the multitude of prints what became very evident is that William Kentridge is fantastic at story telling and so that was another big reason why I was intrigued and interested. 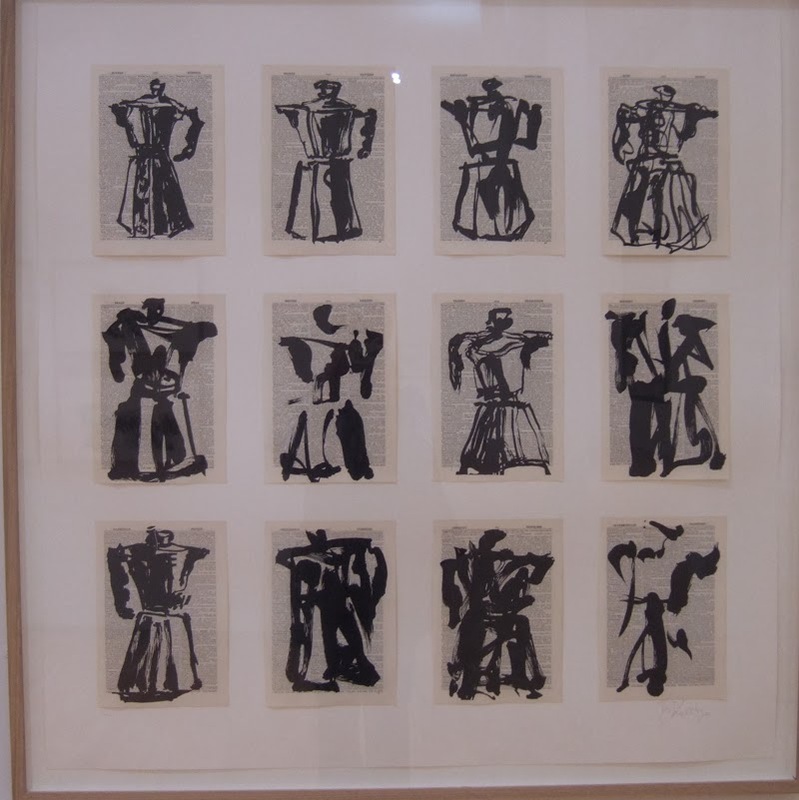 Although the show is a show of William Kentridge’s prints (and he himself says that whether it is his work with ballet, opera, theatre or animation, always at the heart of his practice is printmaking) what I see is a storyteller who has a strong sense of the theatrical in his work. I am especially interested in this as I too am very interested in the theatrical but at present I am struggling to find ways to introduce more performance into my practice. But I should not be too hard on myself; William Kentridge’s practice has developed over many years and things didn’t happen over night for him either. In the 1970’s he spent five years acting and directing theatre in South Africa and then he spent several years studying mime at L’Ecole international de Theatre Jaques Lecoq in Paris before returning to South Africa in 1985. His practice became truly multi disciplinary when he started to work collaboratively with Handspring Puppet Company in 1992. There are various videos online of his presentations, some which feature snippets of his animated drawings projected behind him and others which which actually feature himself having a conversation with himself. These videos give a brilliant insight into an artist who enjoys the creative process, who has refused to restrict himself, who keeps an open mind ... even to the extent that while making his animated drawings he develops the story during the drawing process. He says that the the story unfolds (even to himself) during the physical process of drawing. Ideas develop and evolve during the short walk between the camera and the drawing and these then dictate what he draws or rubs out, re-draws or amends. "Kentridge’s art is an extended thinking process; a fluid intelligent and playful reflection on the world, a constant capturing of experience, of making connections. In his printmaking process this journeying occurs from the initial creation of the plate, to what arises in the printing process, to where this may lead next. In the animation process this journeying occurs from frame to frame, while over his lifetime we see it evolving from art work to art work”. If my enthusiasm has resulted in me writing a blog post which seems a bit confusing then just watch this 3 minute video where the artist speaks very eloquently and engagingly himself.